/ Modified jul 27, 2018 9:42 a.m.
Two cacti at Naranja park in Oro Valley were shot with arrows in early July. 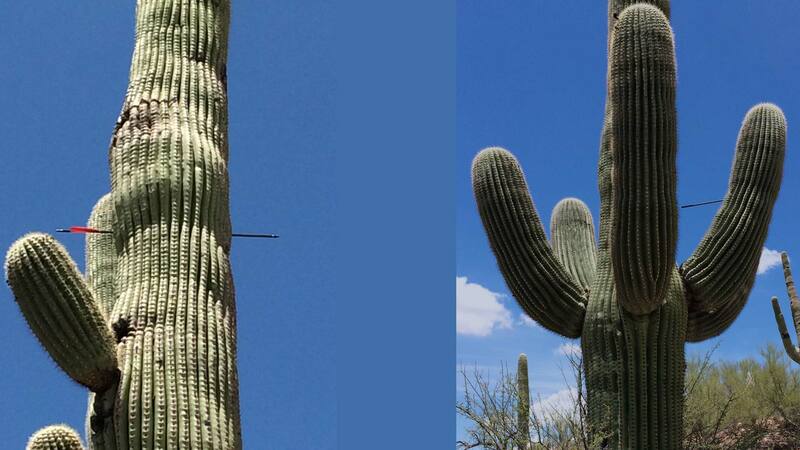 The Oro Valley Police want to know who shot multiple arrows into saguaros at Naranja Park. The event occurred in early July, according to OVPD spokesperson Carmen Trevizo. It is an act of vandalism, but Trevizo said charges may elevate depending on the situation. "It could actually rise to a level of a felony if the cactus is in good condition," Trevizo said. "If it is something that normally the cost to replace it would be over the threshold, that would meet the requirements of a felony criminal damage." Oro Valley Parks and Recreation notified the police department of the vandalism on July 12. It has become a public safety concern, according to Trevizo. One of the saguaros is across from the park's archery facilities. "One of [the saguaros] is actually across the road near a walking path to the west of the archery range," Trevizo said. The other cactus is not near the range. Trevizo said that is reason to believe the act was intentional. The group Pusch Ridge Archers, which is based at the range, is offering a reward if there is a conviction. The Oro Valley Police Department asks that those with information call 520-229-4900. MORE: Arizona, Pima County, Environment, News, Oro Valley, Parks, Public Safety, U.S.